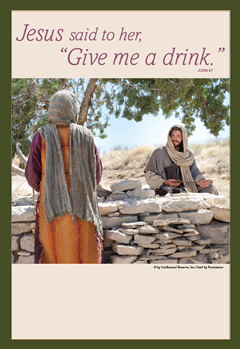 Jesus said to her, “Give Me A Drink.” (John 4: 7) is the theme for the Week of Prayer for Christian Unity (January 18-25). Begun in 1908, these days have been set aside each year so that Christians the world over may share the prayer of Jesus: “that all may be one... that the world may believe” (John 17:21). Note the dates and plan to participate in the following special observances. The annual Week of Prayer for Christian Unity begins today and continues with (event) and concludes Sunday, January 25, with (event). Let us join other Christian churches in our area as we remember the 2015 theme Jesus said to her, “Give Me A Drink.” (John 4: 7). You are invited to participate in these and other ecumenical opportunities: (list planned events and activities).